By scheming and theft, the Thief of Eddis has become King of Attolia. Eugenides wanted the queen, not the crown, but he finds himself trapped in a web of his own making. Attolia's barons seethe with resentment, the Mede emperor is returning to the attack, and the king is surrounded by the subtle and dangerous intrigue of the Attolian court. When a naive young guard expresses his contempt for the king in no uncertain terms, he is dragged by Eugenides into the center of the political maelstrom. Like the king, he cannot escape the difficulties he makes for himself. 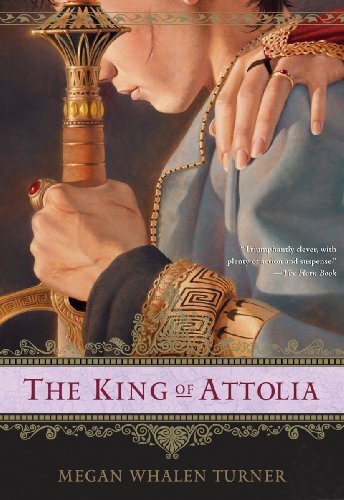 Poor Costis knows he is the victim of the king's caprice, but he discovers a reluctant sympathy for Eugenides as he watches the newly crowned king struggle against his fate. Fans of the Newbery Honor Book The Thief and The Queen of Attolia will recognize Megan Whalen Turner's signature plot twists and turns in the third exquisitely crafted tale about Eugenides. RemusLupin (Grade: A+) Focusing on a brand new character for the main point of view was a bold choice for the author, but it pays off with the best book in the series. Love a good story about earning loyalty and learning how to be embrace your destiny without abandoning who you are. bennettgavrish (Grade: C+) Although the introduction of a new major character is a positive development, this book suffers from the same flaws as the other installments of the series. The plot twists are intriguing but don't feel earned or logical. There's conflict and resolution, but the stakes for this fantasy kingdom seem insubstantial. What the book ultimately amounts to is a dull workplace drama that happens to be set in a royal palace. nhanat (Grade: A) Among all the book in the queen thief series, this one was my favorite. We met again with our beloved thief and much like the first book where he's not being taken highly but then showing his awesomeness.